In Jiuzhaigou (Jiuzhai Valley), tourists can enjoy the exceptional natural beauty with spectacular jagged alpine mountains soaring above coniferous forest around a fairyland landscape of crystal clear, strange-coloured blue, green and purplish pools, lakes, waterfalls, limestone terraces, caves and other beautiful features. They include a number of karst formations, no wonder Jiuzhaigou (Jiuzhai Valley) is a "natural museum" for alpine karst hydrology and research. Located at elevations ranging between 1,990m (6,529 feet) to 4,764m (15,630 feet) above sea level, covering 72,000 ha in the northern part of Sichuan Province on the edge of the Tibetan Himalayan Plateau, Jiuzhaigou preserves a series of important forest ecosystems including old-growth forests which provide important habitat for numerous threatened species of plants and animals, including the giant panda, takin and over 220 bird species. Attaining heights of 4,752 m in the southern Minshan Mountains, Jiuzhaigou also contains an important number of well-preserved quaternary glacial remnants with great scenic value. It was declared a UNESCO World Heritage Site in 1992, the park also joined the Man and Biosphere Conservation Network in 1997. So in this itinerary, we specially arrange you to get into and enjoy the Jiuzhaigou Valley for 2 Day! 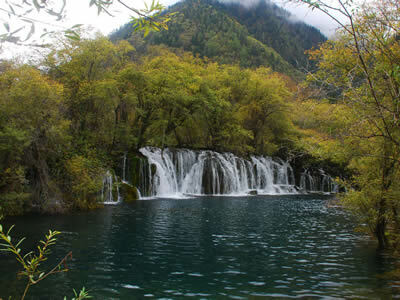 In this way, tourists can have the enough time to fully enjoy the fabulous scenery of the Jiuzhaigou Valley. Tourists will also visit Huanglong Valley which is made up of snow-capped peaks and the easternmost of all the Chinese glaciers. In addition to its mountain landscape, diverse forest ecosystems can be found, as well as spectacular limestone formations, waterfalls and hot springs. The area also has a population of endangered animals, including the giant panda and the Sichuan golden snub-nosed monkey. It is also a UNESCO World Heritage Site with Jiuzhai Valley. * Stroll in Kuan-Zhai Lane area to feel the old Chengdu atmosphere and see the well-preserved historic architectures in Sichuan style. * Meet the lovely pandas in China Protection and Research Center for the Giant Panda, Dujiangyan City Base. * Feast on the fairyland landscape of the crystal clear, strange-coloured blue, green and purplish pools, lakes, waterfalls in Jiuzhaigou Valley and Huanglong Valley. Your private driver and guide will be ready for you when you arrive at the airport or railway station in Chengdu, the capital of Sichuan Province. Get to your hotel in Chengdu city. After a little rest, to visit the well-preserved ancient Chengdu area, Kuan-Zhai Lane (or Wide and Narrow Alleys). Today you will depart for Jiuzhaigou by car (totally 490km/9 hours). During your way, you will feel the scenery outside window changing from prosperous metropolis to sparsely inhabited picturesque area and enjoy the unique buildings of Tibetan Minority and Qiang Minority and some sites of the big earthquake happened in 2008. On the way, tourists will visit Panda Paradise (China Protection and Research Center for the Giant Panda, Dujiangyan City Base) or Liandaoba Prairie for around 1 hour sightseeing. Located around 68km/1.5 hours to the west of Chengdu by car, covering around 510,000 s.m., it is the only professional institution for the prevention and control of disease of Panda. Right adjacent to the natural habitat of Panda, the climate and natural environment here are very suitable for giant panda and can accommodate 40 pandas. Located in the largest wetland in China – Nuoergai Wetland, this Liandaoba Prairie (means Sickle-shape Basin Prairie) looks like a giant sickle if viewed from sky, hence the name. Here tourists are far away from the over-noising city and can free themselves in peace. The air and water here are purely clean and everywhere is green and would be colorful in summer because there are all kinds of flowers blossom on the green blanket. The 3 main valleys of Jiuzhaigou Valley are in Y shape - Chawa Valley, the left branch of the Y (from the entrance to Long Sea at the end of Chawa Valley is 17.8km, From the entrance to Nuorilang area which is in the center of Y is 14.6km. ), meanwhile the right branch is Rize Valley (From the Nuorilang to the end of Rize Valley is 9km.) and the main branch is Shuzheng Valley.). Tourist can take the local shuttle car or walk in it. Today tourists will walk into Chawa Valley to visit Long Sea, 5 Color Pool and some other places on the way to enjoy the exceptional natural beauty. Around 8km long and with the altitude of 3060m, Long Sea is located at the end of Chawa Valley and the highest, biggest and deepest lake in the Jiuzhaigou Valley. Lunch at the Nuorilang Service Center. It is the only one restaurant inside Jiuzhaigou Valley. We are afraid that the service and dish here are not very good. In the afternoon, you can visit Rize Valley. It is around 18km long and located between Nuorilang and the wild forest. This valley is the essence of the Jiuzhaigou Valley – there are many stunning attractions here: Mirror Sea, Pearl Beach Sea, Pearl Beach Waterfall, Panda Sea and so on. Today you will visit Shuzheng Valley, the main valley in the Jiuzhaigou Valley. Here you can enjoy many lakes and waterfalls, such as Shuzheng Sea Group (totally 13.8km long), Shuzheng Waterfall, Nuorilang Waterfall, Tiger Sea, Fire Flower Sea, Reed Sea and Bonsai Sea to feast on the fairyland landscape of the crystal clear, strange-coloured blue, green and purplish pools, lakes, waterfalls. In the morning, drive to Huanglong for around 128km/3 hours. 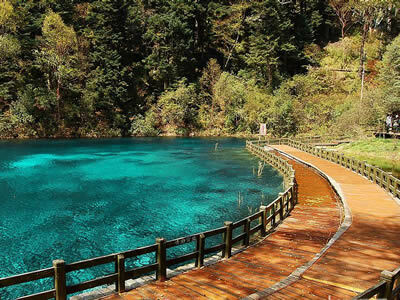 Visit the famous Huanglong Valley including Huanglong 5-Color Pool and Huanglong Temple. The sightseeing will take around 1.5 hours. After lunch, drive for around 350km/6.5 hours to arrive in Chengdu city. Your private guide and driver will wait for you in your hotel lobby according to your flight or train time. They will accompany you to the airport or the railway station, and help you check-in for your next destination.